Home Costs > How Much Does an Air Conditioner Compressor Cost? How Much Does an Air Conditioner Compressor Cost? The compressor inside of an air conditioner unit, unfortunately, is the most expensive part that needs to be replaced. Known as the heart of any system, it is essential that this part is working in order to have a functioning air conditioning system. The compressor is one of the three main parts of an air conditioning unit, along with the condenser and evaporator. The cost of replacing an air conditioner compressor will depend on the size of the unit, brand, geographical location and company performing the job. On average, be prepared to spend $1,000 to as much as $3,000 to have a new air conditioner compressor professionally installed. The more powerful the unit is, the higher that price tag is going to become. If you just want the parts for your unit, then be prepared to budget about $300 to $600 for a compressor that fits your unit. Since each job is going to be unique with pricing, consider using HomeAdvisor.com to get multiple free quotes from licensed contractors in your area. For example, on this city-data.com forum thread, some forum members said they paid $2,600 for a 13 SEER 3-ton unit, while someone else paid $2,275 for their 3-ton unit. If we are talking about a car air conditioner compressor, the costs can vary anywhere from $350 to as much as $1,025 to have one professionally installed. This cost will depend on the mechanic and brand. The parts alone will vary anywhere from $100 to $300. The car air conditioner compressor will involve many moving parts that include a piston and valve. If these internal parts were to fail, the compressor would fail because of it, resulting in an air conditioner that either does not work at all or does not produce cold air. It is fairly common for a compressor to fall apart or have debris build up throughout the system, especially if the car is more than five years old. In order to get the car air conditioner compressor to work again, a compressor will need a clutch, bearing, and electrical connector. A home air conditioner will come with four different types of compressors: rotary, reciprocating, scroll and variable speed. A rotary compressor is commonly found in a window unit and is quite easy to replace. A reciprocating compressor is known to be inexpensive and is found in units that are less efficient and. A scroll compressor is the most commonly found compressor in a high-efficiency unit. Lastly, a variable speed compressor is known to be the most expensive and found in top-of-the-line units. A reputable contractor will include a compressor that comes with a limited warranty. This warranty may be on the part itself or on the repair job as well. The controller boards and caps may need to be replaced with the compressor, which can cost more. When getting work done on your air conditioner, it may be a good idea to give it a tune-up. While most professionals will include this in their quote, some may bill it seperately. During this, a contractor can clean the parts, change the filter and will examine the entire unit to make sure the air conditioner is running as efficiently as possible. If you have an air conditioner with a faulty compressor and decide that you are not going to get it fixed right away for whatever reason, make sure that you avoid trying to run the air conditioner. In a car, this will take a lot more effort for the car and can result in a lot of wasted fuel. In a home, this can make your unit overheat from working so hard and can cause your energy bills to rise. A bad sign that a compressor has gone bad is due to no cold air blowing or a clicking sound coming from the engine. Compressors are known to last 15 to 20 years. If your unit is less than five years old, you will want to check to see if you have a warranty. However, even if your air conditioning unit is still under warranty, you will more than likely have to pay for labor rates. Compressors often burnout due to poor maintenance, power surges or even excess moisture that causes chemical reactions to form acid byproducts. 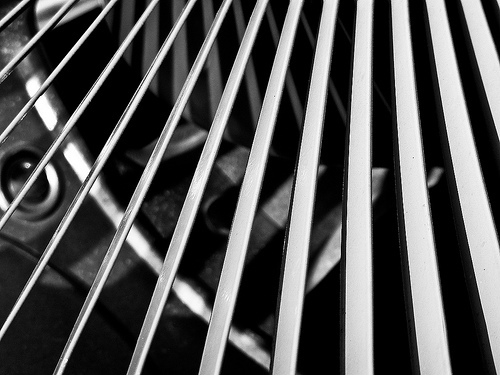 A chattering or ticking-like noise may be coming from the air conditioner. This sound often is due to a struggling air conditioner when it’s first turning on due to a worn out electrical relay. A clicking or rumbling-like noise, similar to the noises mentioned above, may be due to either a failing compressor motor mount or a loose compressor housing. If the refrigerant is leaking outside of the unit, this could also be a sign something is wrong with the compressor. An air conditioner that’s struggling to produce a strong airflow through your vents could be a sign. Lastly, warmer-than-average air could be due to a compressor low in refrigerant. When dealing with an air conditioner, always make sure that you get at least three to five quotes. In the HVAC world, your quotes are going to greatly vary since so many factors are involved. If a home air compressor has gone bad, consider looking at the prices of a new unit. Oftentimes, it will make more sense to spend a few more hundred dollars to buy a newer unit. If you do not have the money to replace your air conditioner compressor, you can consider purchasing a window unit for the main portion of your home until you can save up the money for the replacement.